Digify, http://www.digify.com, a multi-platform confidential file sharing service, today announced that it has been selected as an 18th annual SXSW Interactive Innovation Awards Finalist in the Privacy & Security category. 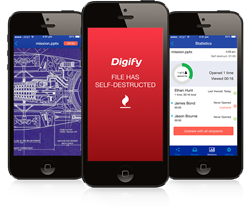 Digify is a secure self-destructing, view-only file content protection and sharing service for professionals to easily retain control of their files after they are sent. Users can now privately share their business content with no worry that their most valued information will be copied or forwarded without their knowledge. Digify’s service is available on Android, iOS, Windows, Mac and the web. Winners from each category will be revealed and honored at the SXSW Interactive Innovation Awards Ceremony taking place the evening of Tuesday, March 17, 2015, on the sixth floor of the Hilton Austin Downtown. Previously called the SXSW Interactive Awards, the rebranded SXSW Interactive Innovation Awards celebrates the best and latest advancements of 2014 across an increasingly diverse ecosystem of platforms, software, apps and devices. Of hundreds of applications submitted, Digify was one of 70 finalist spots given across 14 categories by a panel of judges comprised of industry peers and experts. Other awards Digify received in the past include RSA Innovation Sandbox APJ (Winner), SiTF Best Startup (Gold), SVForum Startup Expo (Winner), CTIA MobileCon Cup (Runner up). With Digify, files shared are view-only and self-destructing. Users can track and unshare their files even after sending. Digify's freemium service ensures that users can control, track and protect files without concern that their private documents or photos will be copied or redistributed after they are sent. Files shared using Digify cannot be downloaded, copied, saved or uploaded elsewhere, and can be set to self-destruct in one minute to one month. Users are notified when their files are opened or forwarded. Digify's advanced content protection helps build trusted, collaborative relationships with partners and colleagues. Digify's service is tightly integrated with storage services, such as Dropbox and Google Drive, allowing millions of users to more easily and securely share and maintain control of their critical documents, presentations, PDFs and images. Users can now safely browse and send a Dropbox or Google Drive file straight from the Digify app. Digify protects content against copying, printing and downloads. Screen recordings and screenshots are blocked on all platforms, except the web. On iOS devices, if recipients try to take a screenshot, the sender will be notified and the file unshared. On all other native app platforms (Android, Windows, Mac) screenshots are completely blocked. Statistics in the Digify app shows who has seen it, for how long, and how often. Files can be unshared remotely at any time. iOS version: Search for "Digify" in the Apple App Store. Android version: Search for "Digify" in Google Play. For more information about the SXSW Interactive Innovation Awards and to view the complete list of 2015 finalists, visit the following site: http://sxsw.com/interactive/awards/interactive-awards. Today, after files are shared, the sender loses control of the information. Senders do not know who has seen their files, and the information is out there forever. Digify is a secure file content protection and sharing service for professionals to retain control of their files after they are sent. With Digify, users can keep track of who has seen their files, unshare it anytime, and have the content self-destruct. Digify is tightly integrated with storage services, such as Dropbox and Google Drive. Digify was founded by a team of professionals who saw the need for a way to stay in control of information after it is shared -- securely and simply. It is a privately held company with offices in Redwood City, California and Singapore. For further information: http://www.digify.com. The 22nd annual SXSW Interactive Festival returns to Austin from Friday, March 13 through Tuesday, March 17. An incubator of cutting-edge technologies and digital creativity, the 2015 event features five days of compelling presentations and panels from the brightest minds in emerging technology, scores of exciting networking events hosted by industry leaders and an unbeatable lineup of special programs showcasing the best new websites, video games and startup ideas the community has to offer. From hands-on training to big- picture analysis of the future, SXSW Interactive has become the place to preview the technology of tomorrow today.